Supergolden Bakes has been included in Channel 4’s Best UK Baking Bloggers amongst some very good company. This unexpected and delightful bit of news has given me a metaphorical kick up the backside to finally launch the blog’s Facebook page. If you enjoy reading the blog and want to keep up with new posts, please pay a visit and show the new Facebook blog page some love! I plan to update it with new posts but will also slowly put some of the older posts on there, together with downloadable PDFs for easy printing/reference. 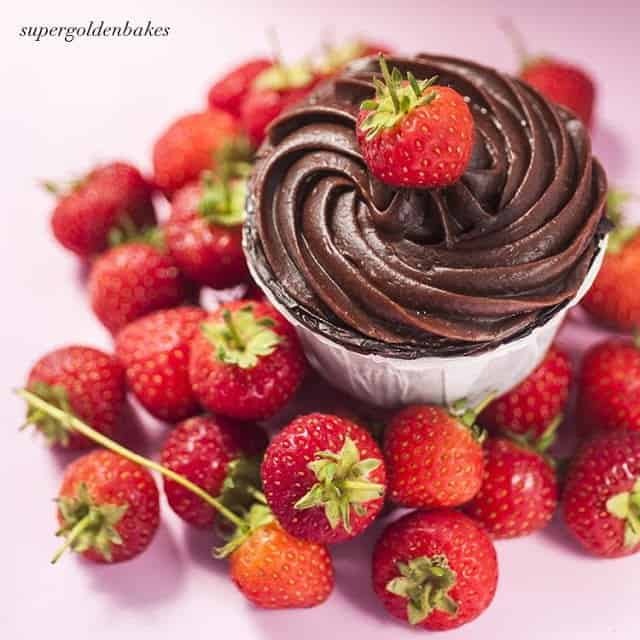 To celebrate all this, I am posting a super-easy and delicious recipe for Chocolate Cupcakes. Anya and I whipped these babies in less than 10 minutes. We were entertaining some of her school friends and since one of them has an egg and dairy allergy these cupcakes are vegan. Not that you would know this when tasting them – they are very rich, moist and utterly delicious. Preheat the oven to 180C | 350 F. Line your muffin tins with cupcake cases. This makes around 16-18 cupcakes. Sift all the dry ingredients into a large bowl. Mix all the liquid ingredients in a large measuring jug and pour into the dry ingredients. Use a whisk to thoroughly mix the two together. That is all! So simple a child could do it. The batter will be fudgy and thick. Fill the cases with the batter – about halfway up. Bake for 15-20 minutes. Mine were ready after 16. Cool the cupcakes completely before frosting. To make the frosting, put the icing sugar, cocoa powder, vanilla paste and coconut oil in the bowl of your mixer. Whisk on low speed until the mix looks like breadcrumbs. It won’t look pretty but fret not, this will come together beautifully once you start adding the hot water. Put some water (should be very hot – not boiling) in a jug and pour a small amount into the frosting while whisking at high speed. Keep adding water very gradually until the frosting comes together and forms soft, glossy peaks. The consistency is more liquid than traditional American buttercream, but it pipes beautifully and looks very glossy. Put a star nozzle into your piping bag and pipe a generous amount of frosting on the cupcakes. At this point you can decorate them. If you put the cupcakes in the fridge the frosting will harden slightly. these look wonderful and I do have vegan friends who would love to try these! These are fantastic, I spent a year being a vegan and would have loved to try one. These look great. I'm moving more towards a vegan diet so always on the lookout for good recipes. Thanks.